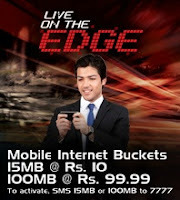 Warid Pakistan has introduced its new and latest Mobile Internet Packages and Buckets. Warid has announced three packages including 2MB and 15MB Daily Mobile Internet Buckets and 100 MB Monthly Mobile Internet Bucket. Connect and search for information on the go with your EDGE / GPRS / WAP enabled handset. To activate, SMS 15MB to 7777. Charges of 7777 are Re 1+tax. Warid Telecom is proud to reveal a new dimension with its improved Edge service. This service marks the telecom company’s step forward in mobile internet. This improved version of the Edge service offers greater reliability, speed, and a one stop solution for all your data needs across the country. Warid’s Edge services will empower consumers with a faster and more consistent online experience which allows rapid browsing as well as faster downloading no matter where you are. Warid is set to take the campaign on-ground with innovative activation that will allow the consumer to experience the superior quality of mobile internet service first hand. Subscribers can enjoy improved service quality with Warid’s 15MB daily internet bucket for Rs. 10 and 100MB monthly bucket for Rs. 99.99 only; to activate, SMS 15MB or 100MB to 7777. Bakwas offers 50mb in Rs 10 guzara karta tha magar ye offer to sab fazool he .is se to jaz pe Rs 10 me 200mb kia bat he warid ko kon puchta he.